Granny shows them how! (Tasmanian Mail 27/6/1918). The idea for an Avenue to commemorate men of the 1st AIF came from the Returned Soldiers Association and was part of an Australia wide movement that began in South Australia in 1916. First proposed for Hobart in late 1917, the project was delayed until 1918 for more suitable planting weather. Fully supported by the Hobart City Council Reserves Committee, the project came to involve a broad cross section of the community and the New Town Council. During the preparations, which were extensively covered in the newspapers and weekly magazines, holes were dug and basic tree guards erected by groups of Scouts, returned and serving soldiers, representatives of sporing clubs, relatives and friends of soldiers, and groups of workers from businesses in central Hobart. The YMCA and women of the community provided refreshments on the cold winter afternoons and the Labour Fife and Drum band provided music. Sgt Foster and helpers allocating trees (Weekly Courier July 1918). The Soldiers Memorial Avenue was inaugurated on August 23rd 1918 with the planting of c390 trees, mostly by the HCC. A crowd estimated at between 8 and 10 thousand attended, representing over a quarter of the population of greater Hobart. The trees were planted by and at the request of the next of kin of men who had died on active service. While most came from Hobart and new Town, there are men from Richmond, Bruny Island and the mainland; all had trees because a relative resided in Hobart. A further 110 trees were planted on February 15th 1919 with the balance of the trees planted during 1919 and 1920. Stretching from Aberdeen St, by the Hollow (now occupied by the Aquatic Centre) it snaked along the eastern slopes of the Domain to ridge at the northern end of the TCA ground and then along the slopes to the Cross Roads. Over 520 trees were eventually planted with the Avenue broadening to 4 lines of trees along most of its length. Part of the Crowd on August 3rd 1918. (Tasmanian Mail 8/8/1918). There are also two isolated cedars to the city side of the Cenotaph. These trees were planted in 1926 by the Hobart City Council Reserves Committee to directly connect the Avenue to the Cenotaph precinct. 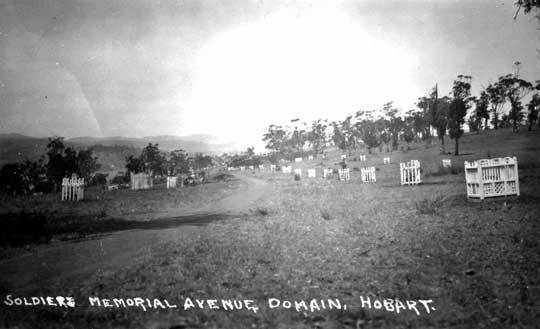 The War Memorial Committee in 1920 had decided that any Hobart war memorial had to be adjacent to the Avenue. The original planned site for the memorial had been on Blundstone's Flat on the first major bend of the Avenue. The current site became available in 1924 - 20 trees were planted as the Soldiers Memorial Avenue Extension to fulfill the promise. Most of these trees disappeared in successive redevelopments of the precinct in the 1950s and 1960s. Stan McDougall VC at the tree for his brother Wallace (Courtesy Watson family). 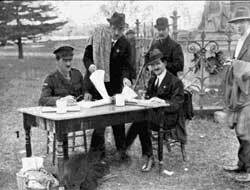 The process of establishing the names of 500 of those commemorated was relatively simple. The balance of the names taking the total to 533 individuals was more complex but is now complete. A map from Council sources (date unknown but probably the late 1930s) is an additional source of data as are lists published in The Mercury in 1918 and 1919. Some families have clear memories of trees planted but thus far the public record does not allow complete verification. The Hobart Town Hall Honour Board was also used as a source to verify family recollection. The process of comparing these sources has been painstaking and time-consuming. During the 1920s, groups such as the 12th and 40th Battalion Associations, the Soldiers’ Wives and Mothers Association and the Soldiers and Sailors’ father’s Association as well as families slowly painted the tree guards with paint provided by the Council. By 1923, the Avenue had been irrigated, had a permanent gravelled central pathway laid by unemployed and disabled soldiers and seats placed along its length. From the very first the Avenue became a focus for both public and private commemoration and remembrance with The Mercury reporting on families visiting the trees as part of the Armistice services in November 1918. The trees and the Avenue became the focus for many families. When the irrigation was turned off due to vandalism, families, especially women, carried water to struggling trees in hot summers, repaired tree guards, weeded and placed flowers and wreaths. Some began to turn the sites into shrines much to the annoyance of the Council with the reserves Committee announcing in 1920 that tree guards that did not conform to the Council pattern would be removed. A postcard of the Avenue from the 1920s (courtesy of John Trethewey). By the late 1920s, the Avenue was in such a state of repair that the Mercury and RSSAILA (now RSL) run a public subscription campaign for improvements and maintenance of the Avenue. In the early 1930s the path along the centre of the Avenue was gravelled as an unemployment relief program. The HCC Reserves committee also notes the poor state of the name boards with many obliterated totally or difficult to read. It has not yet been established precisely when these boards were replaced with metal tablets but the Council map of the Avenue may date from that period. The map lists no name against some trees and pencilled provisional entries against others. Obviously there was no extant full record of the trees and names at that point and an “unknown” probably indicates that the name board was impossible to read. These names have in most cases been identified through the lists in the Mercury from 1918 and 1919. During the 1960s the last tree guards were removed due to their poor condition and the fact that many trees had simply outgrown the need for them. This also served to reduce the formality of the Avenue. Also during this period, many missing trees were replaced with Italian Cypress, chosen for its formality but not in keeping with the predominant tree shape and colour. This may have been done to link the Avenue to the Cenotaph precinct which by now had flanking rows of cypresses leading to the memorial or simply because there was stock available. The greatest loss of trees on the Avenue resulted from the decision to place a “temporary” tip at the northern end of the Avenue in 1960. Despite protest, the decision was implemented and over 80 trees were bulldozed. In part it seems the decision was influenced by the Education department pushing for the creation of new sports grounds accessible from local schools. Initially the Department was to pay part of eth cost but there was certainly some dispute about funding at the time. The present Cross Roads cricket and soccer grounds (the larger oval) was subsequently built on the site. A small remnant of the Avenue exists hidden in the copse of she oaks at the Cross Roads. During the 1970s blue gums were planted between the trees flanking the path; it is not known why this species was chosen or why the inter-planting was even undertaken. Its main impact has been to obscure the overall dimensions and sweep of the Avenue. These trees have not always thrived and are no more in keeping with the natural surrounds than the exotic trees of the Avenue proper. The current Aquatic Centre replaced the old Hobart pool, which had been built in an area on the city side of the Avenue at the southern end known as the Hollow. The Hollow served for decades as a local speakers corner, hosted a steam carousel and was a natural site for visiting circuses until the building of the first pool in the 1950s. The first pool did not threaten the Avenue but a number of trees were felled as a result of the new Aquatic Centre and associated road works. At least 6 trees were removed and a number of others condemned to a precarious and eventually fatal existence on a new road cutting. Other changes to the Tasman highway accounted for another tree. This was better than the original proposals which would have condemned about twenty trees; an outcome prevented by the intervention of the Hobart City Council. Over the years the Avenue remained the focus for commemoration by many families but as those who actually knew the soldiers whether parents, siblings, wives, sweethearts and friends died the Avenue lost its most passionate protectors. This included councillors with relatives on the Avenue such as former Mayor Meagher and prominent identities such as Stan McDougall VC, whose brother Wallace is on the Avenue. The Great Depression by straining budgets and focussing effort on infrastructure with direct economic value also diminished the Avenue in the eyes of policy makers. The outbreak of the Second World War and the mourning for yet more war dead also diminished the popular profile of the Avenue though for some families what had been a tree for one serviceman now became a shrine for two. The tree of Pte Cahill still has two bouquets of flowers placed in its boughs each ANZAC Day. The connection to a tree persisted for many families. Stories abound of families using the tree as a meeting point before going to the Regatta, with grandma insisting on a brief moment of silence. Some families tended the trees for decades. Equally for many families connections with a tree was lost as older members of the family talked little about lost relatives or the tree planted for them. The reasons for that are complex and may be generational or due to some form of survivor guilt. The slow deterioration of the Avenue and the low priority placed on it by the Council would not have helped and may have made it easy to dismiss the whole project as sentimental indulgence. Increasing ignorance of the existence of the Avenue did not help as more formal monumental commemoration became the focus of attention and the Avenue, when known of, became a minor curiosity. Without a clear organisational champion, the Avenue was allowed to slowly disappear as a priority or concern for Council and most residents. The renaming of the Avenue as Soldiers Walk and the removal of many individual tree plaques in the 1980s broke the link between individual soldier and tree and also reduced the Avenue to anonymous exotics dotted amongst an increasingly chaotic visual landscape. The transformation of the natural environment from the open grassland of the early years to the scrubby grassland filled with weeds, wattles, blue gums and so on nearly submerged parts of the Avenue, hiding them from view. Over the years fire has caused considerable damage in the northern sections by scorching foliage of some trees. In the southern sections, many trees suffered the effects of cars as part of the Avenue was used for parking area at Regatta time until the 1980s.